No Peace, Only Pieces – The Sufi Mission in Kashmir! The article examines the iconoclastic activities of Shamsuddin Araqi , one of the most ‘peaceful’ Sufi missionaries of Kashmir and his role in the destruction of Hindu and Buddhist temples of Kashmir, Ladakh and Gilgit-Baltistan. The article has been republished from author’s blog with permission. Of late, eminent intellectuals, perfumed or otherwise, have been raising a stink about how as a society we should be ashamed of the many things we do. Their infinite wisdom manages to open our eyes (though, more often the third one)! We concur wholeheartedly with them , for, as a society we should be ashamed of naming innocent infants after marauding, mass murderers. But we are not! As a society we should also be ashamed of blindly believing the propaganda that paints Sufis as the great proponents of humanity and upholders of faith and tolerance, for, nothing could be farther from truth. This false narrative has pulled more wool over the gullible masses’ eyes than what has been used for weaving the caps after which they are named! We have debunked few such myths about Sufis in this earlier post . 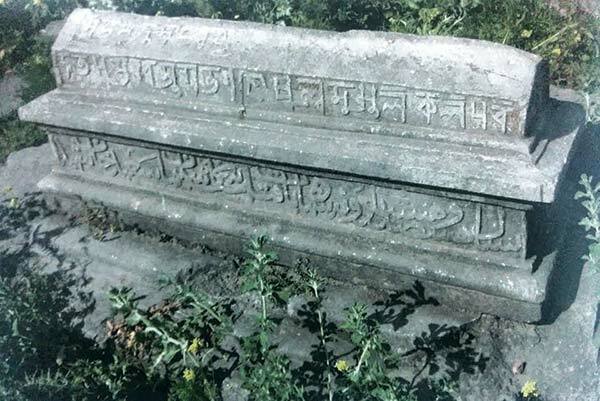 Through this series of posts, we intend to examine the iconoclastic activities of Shamsuddin Araqi(c.1480 CE) , one of the most “peaceful” Sufi missionaries of Kashmir and his role in the destruction of Hindu and Buddhist temples of Kashmir, Ladakh and Gilgit-Baltistan. We shall be highlighting Sufi Araqi’s role in the historical religious transformation of Kashmir from a 100% Hindu to a near 100% Muslim society within a span of 100 years. His role in the slave trade of Hindus shall also be examined through the series. We shall also highlight the unprecedented retaliation of the Hindus of Jammu and Kashmir to these evil Sufis . Information about Araqi comes primarily from Tohafut-Ul-Ahbab, his biography written by his disciple Muhammad Ali Kashmiri. He often accompanied his father on their visit to Shamsuíd-Din Araki in his hospice at Zadibal, Srinagar. The biography indicates that he was an eye witness to many events connected with Araki’s ‘piecesful’ mission in Kashmir. Two more sources are the Persian chronicles Baharistan-I-Shahi (completed c.1614 CE) and Tarikh-I-Kashmir. 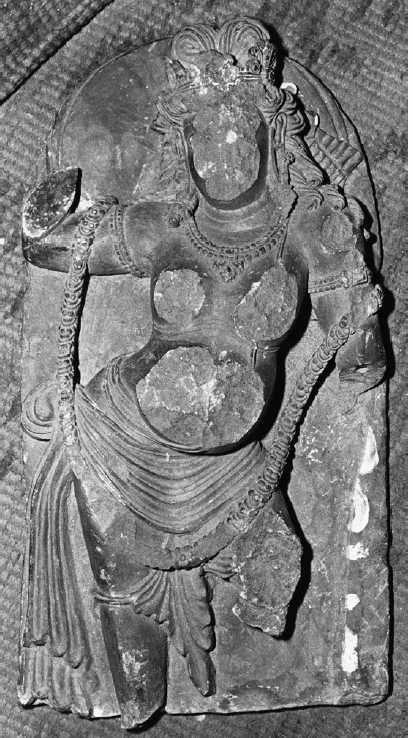 Srivara’s Rajatarangini also gives us a glimpse of Kashmir in those days. We also rely on epigraphical and archaeological evidence to accurately document the past. Shamsuddin Araqi was born in Solghan in Northern Iran in the year A.H 828/A.D. 1424. He belonged to the court of Mirza Bayaqara(AD.1470-1505), the Timurid ruler of Herat. It so happened that the ruler fell ill and the Sufi was sent to Kashmir for procuring medicinal herbs for his patron. However, on reaching Kashmir, the Sufi saw that Kashmir was a Hindu society steeped in what he called “idolatry”. In the beginning, he resorted to the option of Taqqiya by falsely claiming is allegiance to the Hamadani Sufi order of Kashmir which had already been established in Kashmir, The truth is that he was , in fact, the Sufi of Nurbakshiya order which had no presence in Kashmir. 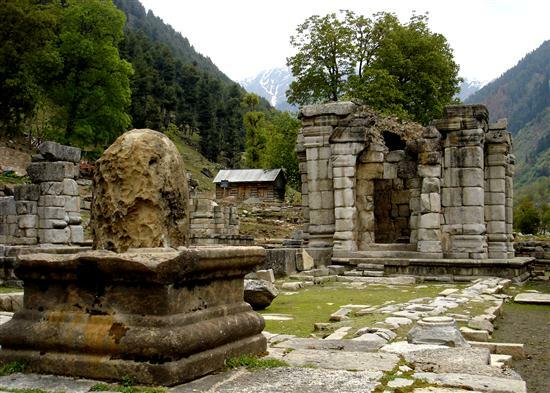 Araqi assumed the role of an emissary of Islam and propagated his Sufi order by waging Jihad on Hindus of Kashmir and destroying their temples. Shamsuíd-Din Araki had traveled from Srinagar to Skardu propagating Nurbakhshiya sect of Sufism, first in the valley of Kashmir and then in what is now called Gilgit and Baltistan. His mission in the southern foothills of Karakorum Range of the Himalayas was more than successful, and he left behind many people who have, ever since, stuck to his faith. From among the Shaykhs of high order and stalwarts among the spiritualists, none had the honour of breaking so many idols and destroying so many temples as Shamsuíd-Din Araki had for the sake of propagating, and strengthening prosperity of Islam. Only he was blessed to eradicate lock, stock and barrel the dark and depraved customs of the community of darkness, their rituals, laws and beliefs. No Sultan, Padishah, Governor or noble could claim credit for an achievement like that. 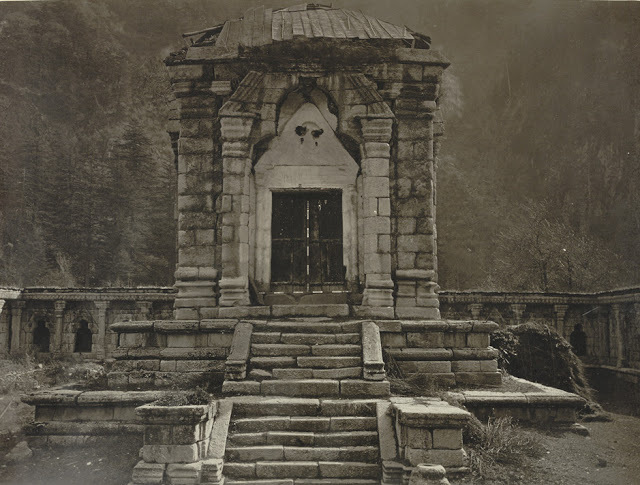 ” Araki proclaimed that the purpose of his visiting Kashmir was to pull down temples of Hindus. His first task was to put an end to the customs, traditions and habits of the Hindus (Kafirs) . He ordered a band of sufis and devotees to come to his presence. Taking this group along with him, he came to the Koh-i-Maran(Hari parbat). He made all the polytheists, corrupt and dissipated people run away from that place. He ordered baton charging of dancing and singing women, musicians and drumbeaters until they disappeared. A prayer house of the infidels existed at that place.Its foundation was dismantled, and the idol house was set on fire till it was fully consumed in flames. The bright candle of religion and Islam brought by the Prophet, and the law of his religion and the path of Mustafa and Murtaza (Ali) was lighted. He initiated the task of breaking the idols and idol..Later, he took along with him a group of his associates and Sufis and went up the heights of Hari Parbat. Together they destroyed even the smallest remnant of the temple and scattered pieces of the idols (previously broken by them). He directed that the ground where the temple stood be levelled so that the foundation for a Mosque (Bait-Ulla) could be laid on it”. 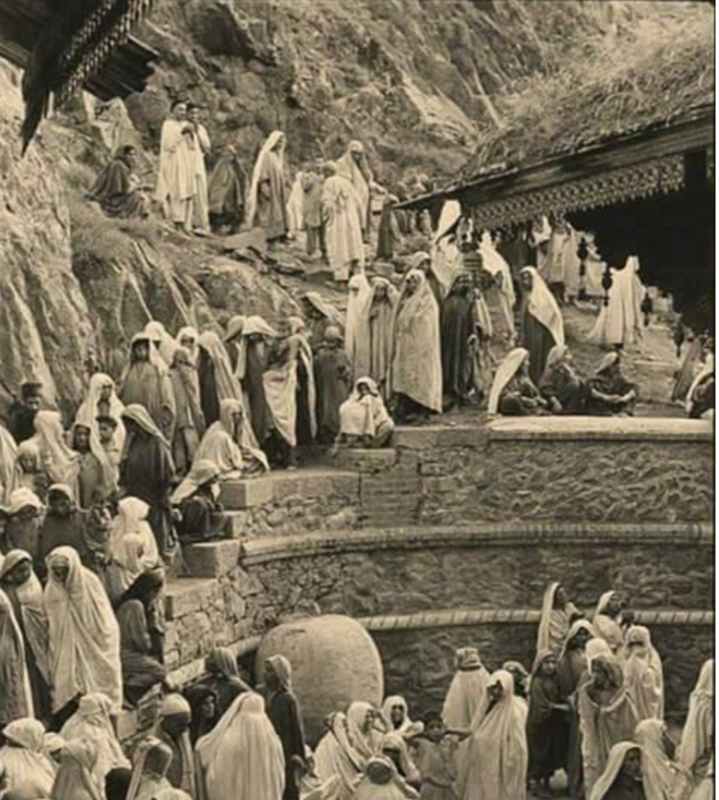 Archaeologist Mark Aurel Stein remarks, “The E. slope and foot of the hill is now covered by extensive buildings, including sarais connected with the famous Muhammedan shrines of Muqaddam Sahib and Akhund Mulla Shah. These probably occupy the sites of earlier Hindu structures such as the mathas referred to in the above verse”. Ruins of Hari Parbat Temple which had been destroyed by Sufi Saint Araki. 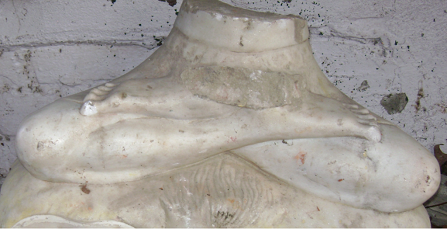 Picture taken before restoration. 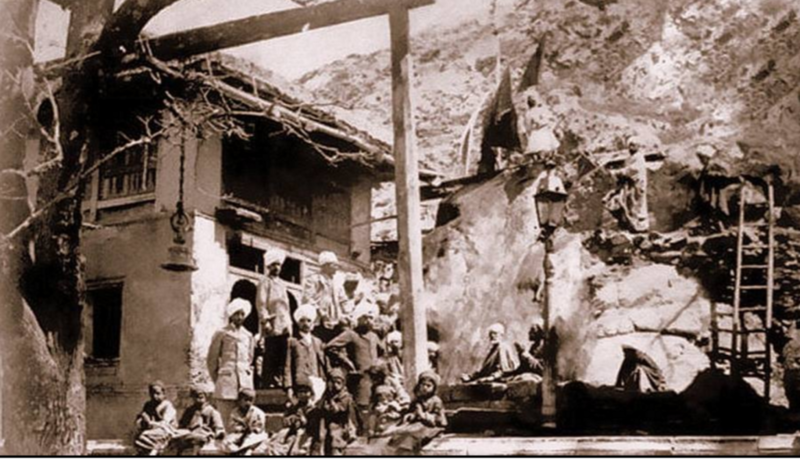 An old picture of the Shrine of Makhdum Sahib that was built on earlier Hindu structure. Stein records, “A short distance to the S.E. of Bhimasvamin rock and outside Akbars fortress has the Ziarat of Bahaud-Din Sahib, built, undoubtedly with the materials of an ancient temple. The cemetery which surrounds it maintains also many ancient remains in its tombs and walls. To the S.W. corner of this cemetery rises a ruined gateway built of stone blocks of remarkable size and still of considerable height. 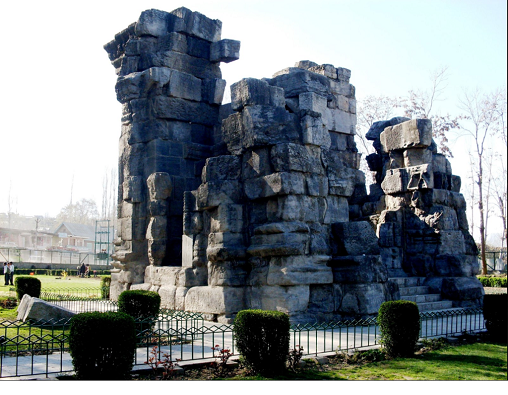 This structure is traditionally believed by the Srinagar Pandits to have belonged to the temple of Shiva Praveshvara which Kalhana mentions as the first shrine created by Pravarasena in his new capital”. Its stone walls, five to six yards high, were left standing but the stones and earth that had formed the foundation of the temple inside were taken out. A mosque was raised inside the compound where the temple stood previously. In his search for timber for the construction of the hospice at Zadibal, Araki went to Kamaraj, the site of the Mahasen temple where Hindus used to visit for pilgrimage. The temple housed a stone idol surrounded by tall fir and deodar trees, felling of which was prohibited out of respect for the temple. After breaking the idols and setting the temple on flames to raze it to ground, Araki engaged himself in felling trees. At the site of the temple that was destroyed, he built a Jamía mosque. A big temple existed in Baramulla area in Kamaraj pargana. It was called Warbalaru in Kashmiri language. Araki destroyed it and erected a mosque over its ruins. An Imam and caller of prayer (muíezzin) were appointed for the mosque. The imposing Nadraz temple in Shivaz in the Pargana of Kamaraj was destroyed by Araki and a Jamia mosque was raised on its ruins. Ruins of the destroyed Nandakeshwar Temple. 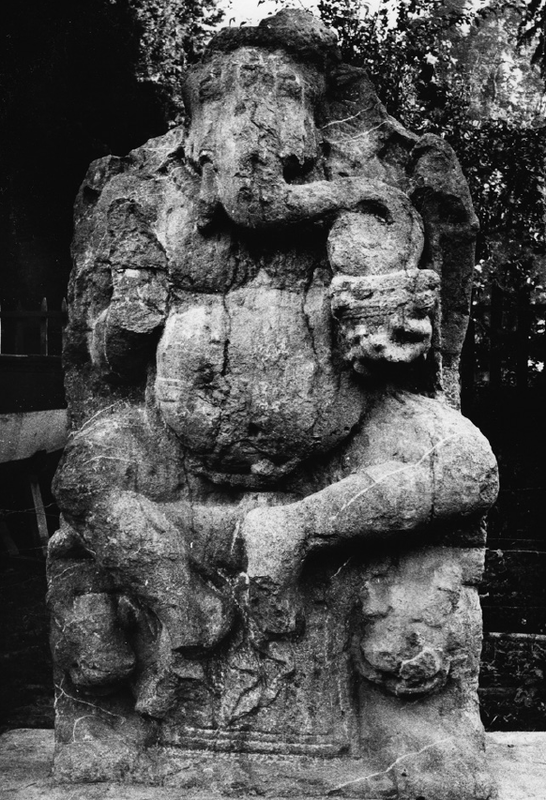 Araki’s converted disciple Shri Bhat was assigned the task of destroying this temple in Bomar. Since the villagers of Bomar were mostly soldiers by profession, they fought against the razing Sufis for two days but lost. The Temple was destroyed, the various trees in the premises felled to lay the foundation of a mosque. 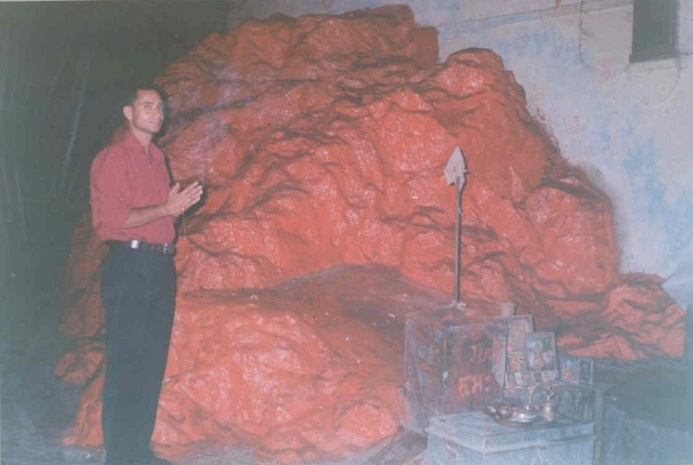 The idol placed under the threshold of the mosque so that visitors to the mosque would trample it under their feet. 7) Shri Bhat also destroyed the famous temples of Kamaraj, which for example, included those of Uttarasher (sic), Badakot, Kubisher (sic), and Gushi Temple in the localities of Kandi, Shaki Shiraz (sic), Kupwarah and Drang. In the remote areas of the towns of Sopore and Baramulla, and in inner rural areas of Kamaraj, he pulled down all temples and built mosques in their place. 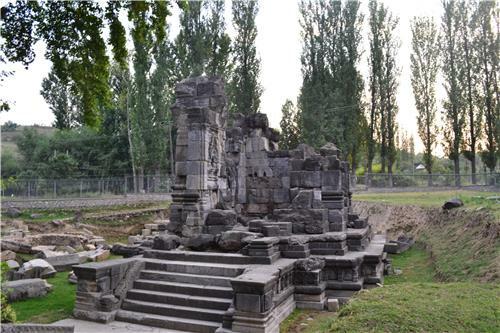 The temples of Jatti Renu, Kandi Renu, Bachhi Renu in Kamaraj and Satwal temple in Sopore were all razed and destroyed. Araki had built the Nurbakhshiyyeh hospice (Khanqah) in the locality of Zadibal which had the huge Paneh Renu Temple to its right. The temple had a spring skirted by tall firs and other trees. Araki wanted the temple to be destroyed and the trees felled and assigned the task to Hazrat Baba. A Mosque was built on the ruins. Since this big temple was situated close to the graveyards of the Sayyids and Shaykh Bahauíd-Din, Araki believed that pulling it down and destroying it was incumbent upon Muslims. He personally supervised its demolition. A mosque was constructed on it and a muíezzin was appointed. This place was given to Malik Regi Chak for burying the dead of his family and close relatives and friends. When Araki and his men proceeded to demolish this temple, Hindus from the regions of Udaran and Sipahiyan-e-Hind, took up bows, arrows and other arms and locked the idl-razing Sufis into battle for several days. The Sufis were forced to retreat towards Zaldagar plains to protect Araki who was brought under security to the house of one Abdal Magray whose wife was the daughter of Malik Musa Raina (king’s regent). Womenfolk and servants of the neighbouring Hindu household hurled garbage at the idol breaker sufis as they had deserted and demolished their temples. Musa Raina accompanied Araki on the mission of demolishing the temple and also asked his son Malik ëAli Raina to arrest the leading personalities among Hindus. Many of them were sent to prisons and many were banished to regions outside the valley. Even the smallest trace of the temple was effaced – stone-idols broken into pieces and crushed, wooden idols set on fire and the temple complex inundated.With not a trace of the temple left, a mosque was constructed on the site. Since this was the only place where Araki faced resistance to temple demolition , he compared it to a Jihad and he named it Islampor. A two-storey structure was raised here. This temple on the island of Kol Blareh was demolished by Araki in person. He built a mosque on its foundation. Having done it, he left behind one of his dervishes for conducting five-time Muslim prayers and for giving call for prayers (azaan). Janak Renu The big Janak Renu temple stood towards the north of Idgah in a place known as ìKalanvethî. Araki demolished it and built a mosque on the site. Orchards endowed to the temple were turned into melon and melons growing farms. A mulla with a couple of sentries was appointed to look after it. Situated near Rainawari, this well-known temple was visited by Jogis from all over India in large groups on pilgrimage. Araki came to this place and got it demolished and got a mosque built on its ruins/site. The ground lying all around the temple was cleared of dirt, and cells were erected on it. The temple was destroyed and most of its big stones used for building the Zadibal hospice. 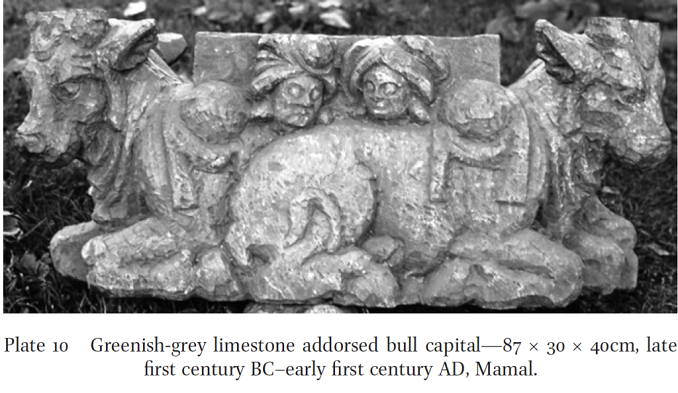 Some of the stones retrieved from the destroyed temple were carried to Islampur for use in the hospice at that place. Some stones were used in the construction of a canal at the same place. This temple on an island of Dal was demolished by Araki and a mosque built on the ruins. This temple situated close to the Bazar-e Misgaran was demolished on Araki’s orders. The site was levelled and a Mosque constructed. Araki bestowed his follower Khwaja Tajuíd-Din with the land and along with the mosque. Gangabal was a very important pilgrimage for Hindus and it was considered very holy. Hindus from all over The people of India considered it as holy as the water of the Ganges. Anybody visiting Kashmir would visit the Sudarabal temple there and have a dip in the waters of its spring. Araki demolished this temple and built a mosque on its ruins. The temple lands were seized as endowment, and a mulla was appointed to conduct five-time congregational prayers according to Islamic tradition; its vineyard was given to be the property of the mosque. During the lifetime of Araki, Hindus could not go on the pilgrimage to Gangabal shrine. This Langar Khaneh (alms house) was located in the locality of Raenwor close to the waters of Dal Lake where Jogis and other Hindu piligirms from all over India used to stay and pray. This was the base camp for pilgrimage to all temples in Kashmir. Araki tried to obtain permission from Sultan Fath Shah for its demolition who refused it citing its construction by his grandfather BudShah. Araki then got Inrahim Magray the head of the justice department to issue a letter authorising its demolition. Araki took sufis along with him and engaged them in demolishing the structure. The site was levelled for the construction of a mosque and a prayer ground and a mosque was built there. While this was being done, local Hindus joined hands to to confront the sufis and fight against them but they were defeated. Sikandar, the Iconoclast, had demolished this lofty and massive temple and brought stones from this very idol temple for use in Jamiía Mosque and the tombs of the Sultan(s). The temple was rebuilt and restored to its previous glory by Sultan Zainul-ëAbidin. Araqi intended to have it demolished. An idol stood planted in the ground besides the building which Sikandar had not succeeded in breaking. It had been put to flames several times but in vain. It was pounded with iron rods and other strong metals but it did not break. Not a single limb of the statue could be broken. Araki tried hard to have it destroyed but it did not break. He then asked for the earth and stones underneath the idol be removed to make a deep crater. This and other statues were buried in the ditch and covered with earth and stones. Four cells were raised on each of the four corners of the complex. The structure that was raised on the ruins of the demolished temple comprised of two floors. Ruined temple at Pandrethan Destroyed by Sufi saint Shamsuddin Araqi. 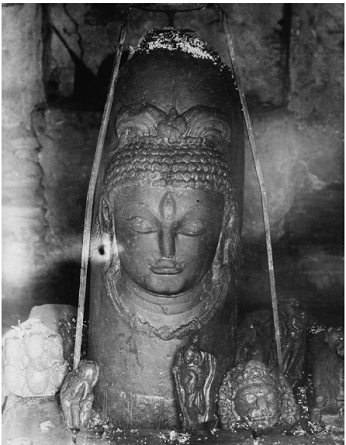 Multilated idol of Kubera from Pandrethan shrine destroyed by Sufi saint Shamsuddin Araqi. It was demolished and converted into a mosque. Not a trace of demolished temple was left behind. Kharboshtaz Temple He also demolished the temple of Kharboshtaz. This one was more popular than many other idol temples of Kashmir. The temples of Jwalamukhi, Khodrenu, Lankeh Renu, Bakhi Renu, Luti Renu, Soneh Renu, Parzdan, Tsarenmal, Kupwur and Zachaldor were demolished by Shamsuíd-Din and mosques were built at their site. A temple stood in the village called Sonwar. On the ruins of the (demolished) temple, a mosque was raised so that five-time a-day namaz (prayer) could be offered. 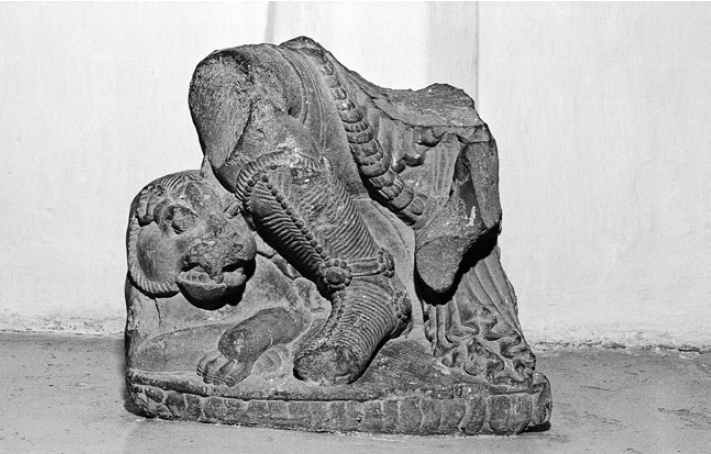 Mutilated idol from the remains of Temple at Sonwar destroyed by Shamsuddin Araqi. Temple It was demolished and a mosque was built at the site. Mullas were appointed to bring Islam to the place. They were taught the obligations of faith and Islam, namaz and ablution, etc. This big temple was demolished and on its ruins a Jamiía mosque was built. Araki demolished this temple that stood close to the spring in the village of Narvor Narwol and built a mosque on its ruins. A mulla was appointed to take care of it . 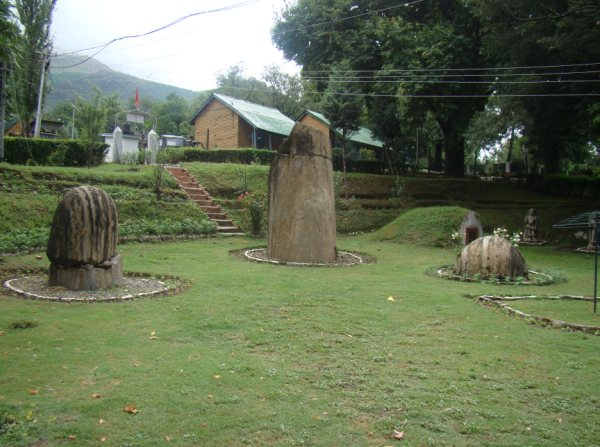 This beautiful and artistic temple in the town of Vejehbrara (present day Bijbehara) with four rising pinnacles, was demolished by Sikandar the Iconoclast who got the pinnacles removed without causing them any damage. These were placed on four well-known structures in the city – Jamiía Masjid, thospice of Amir Sayyid ëAli Hamadani, cupola of Sikandar’s tomb, and his palace. The temple was restored to its earlier glory during the reign of Sultan Zainuíl-íAbidin. Araki ensured that the foundations of the temple were demolished, and its stones were brought to the city, where these were used to build the boundary wall of the Hamadaniyyeh hospice. A mosque was raised in its place. It stood in the same locality (Vejehblareh/ Vejebror). It was also demolished and with that all traces of idol worshipping and polytheism and also the customs and shrines of the infidels were uprooted once for all. 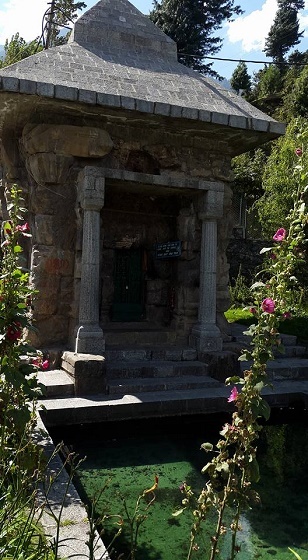 A temple stood in Kuther by the side of the spring. Araki dispatched a group of sufis to demolish it. Arrangements were made for five-times congregational prayers in that mosque. A mulla was appointed to look after these duties. 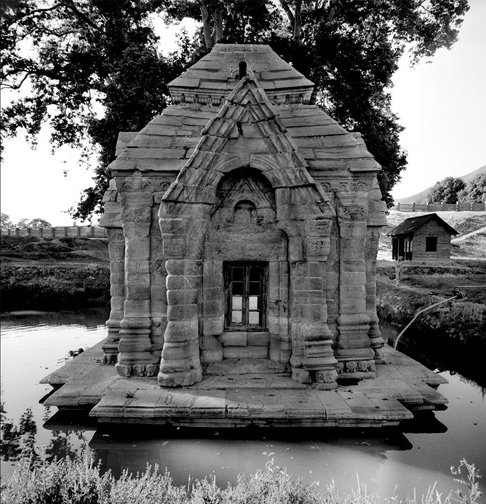 An idol temple stood in the village of Achhabal by the side of the source of water. It was annihilated, and a mosque was raised at the site. One of the Sufis named Mulla Shankar was appointed Imam to lead congregational prayers . Many temples stood in the villages of Sagam and Lokeh (Bhavan) by the side of the springs and away from these. These were annihilated and mosques in their place built. Mullas were appointed to conduct prayers. The big temple which existed close to the spring in the village of Ver was demolished and a mosque was raised in its place. A Mulla was appointed to conduct prayers, give call for the prayer and deliver sermons. After the demolition of this temple, bands of dervishes and sufis came to every place in the village and along the road where there were temples. They destroyed not only the temples of the infidels but also uprooted their customs and traditions. They wiped out all signs of idols and their remains so that the banner of Islamic religion and the shariía (law) began all over that region. क्यों ज़रूरी हो जाती है 3600 करोड़ की मूर्ति?